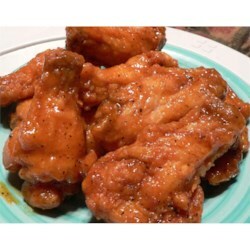 "Sweet and spicy wings! You can make two batches of the sauce, use one as a marinade before grilling the chicken, and pour the second batch over the chicken after it is grilled. It is not mandatory to do it this way, just better!" Watch Chef John make sweet-and-spicy chicken wings with PBJ! Believe this is one of the best wings sauces I have eaten. Quick and easy to prepare, we did ours on the grill.